In my never-ending bid to avoid the big projects on my never-ending to-do list, I started making these fun zippy pouches in between rounds of watching Master's golf last weekend. I had a terrible head cold, so something small was the limit of my focus. I pieced together a bunch of scrappy strips, then cross cut them to form the middle panels between some organic linen/cotton blend. I think colourful zippers are the bees knees and I decided to go all matchy matchy with the linings. If you're going to all the trouble (and honestly, it's not that much trouble, really) to sew zippers into things, you might as well put something surprising and fun inside that zip! 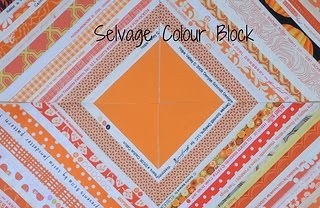 Along with these, the pouches are intended for the boutique at my guild's quilt show in June. The hardest part for me is to put them away and not gift them to people before the show! 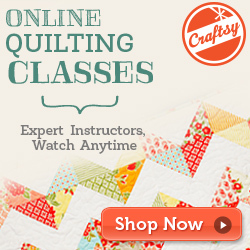 I know you're all with me on that....almost every quilter I know is a chronic gift-giver. Generally a great thing, except when you're trying to stock a boutique! Hey, notice anything unusual in today's photos? Ahh, those would be shadows! Which means the sun is shining brilliantly. Il fait du soleil! Big time! Yippee. 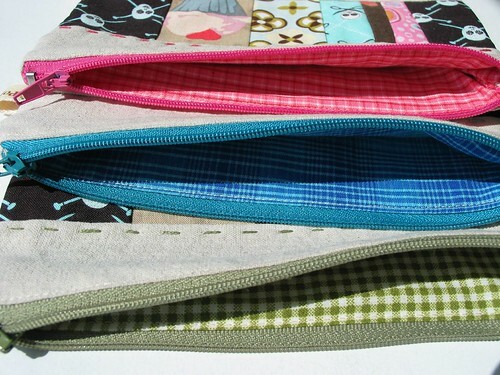 great little pouches, and I love the matching zips/lining. 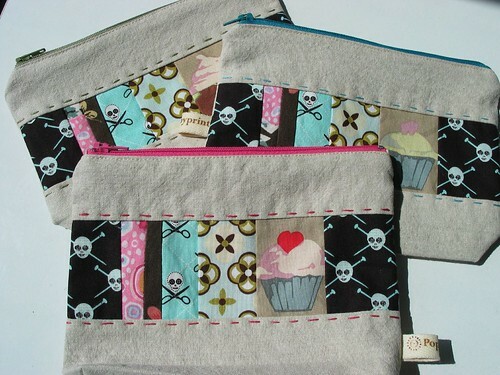 I like that cupcake fabric in there amongst the sewing skulls - great combo! These are adorable! I really want to make some now. Cute fabrics too! Love the French and the zippy pouches! Congrats on the sun! I'm with Heidi on that...I want to make some now, too. I'll have to make myself finish some other things first though. Your creations are always so cute! My daughter was saying that it is gorgeous outside!! You know what that means...our lawn will be up to our waists!! I say it's time to go home...unfortunately I am not behind the wheel!! Take care and enjoy the sun...hope your cold is better! Feel better honey! Darling pouches! I almost feel like making myself some. These are so cute!!! And your zippers look so perfect. I'll be right behind Dianne for your zippered pouches and pot holders. Can't wait to see what else you're going to come up with! Oh Krista, they are gorgeous! I don't think anything involving zippers look easy, so I probably need to work on my zipper skills. 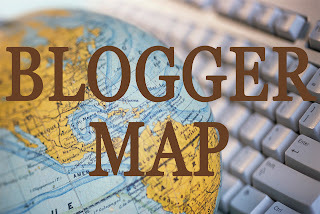 Thanks for the links; I'll check them out. Love all your zippy pouches!! 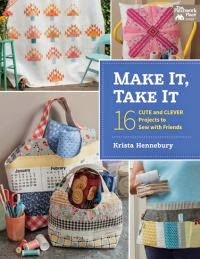 I think that you have inspired me to make some, possibly as christmas gifts!! Thanks for the inspiration. They are beautifully made. I have to laugh to see the skulls and cossbones mixed with a little cupcake! You are so busy, Krista. I wish, I was busy with some sewing projects.... Soon! Enjoy your weekend. I have sent your package. You have made my day. 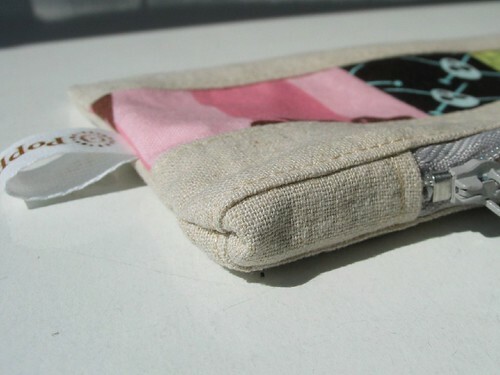 The pouches are a brand new item for the boutique and oh so delightful. I was hoping for a new thread catcher so thank you, thank you, thank you.